Today’s guest is Keisha Sibert – Party Stylist and Owner of Cupcake Wishes & Birthday Dreams. 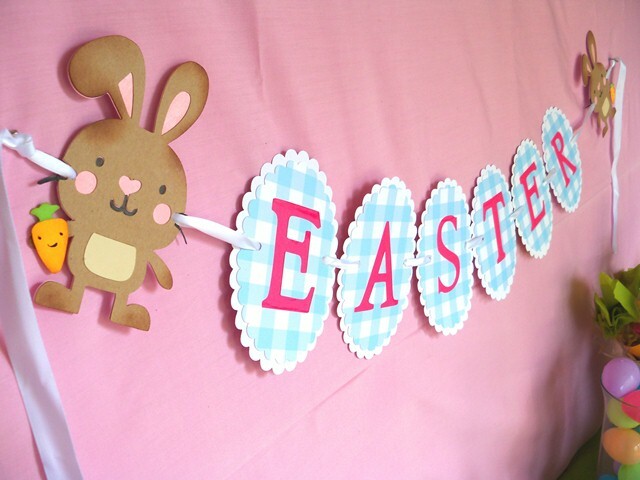 She stopped by to show us how to design an adorable and affordable Easter sweets table. Take a look at Keisha’s great ideas: I love planning and styling parties, but nothing excites me more than setting up a delicious sweets table for my guests. More and more, you will find the beloved sweets table (aka, treat table, dessert buffet, candy bar/buffet) at plenty of celebrations and parties. The popularity of these sugary displays cannot be ignored, and in my opinion shouldn’t. I mean, who doesn’t love sweets?!!!! While it’s great to use the sweets table as an awesome focal point for your celebration, if you aren’t careful you could end up paying a pretty penny to design one. 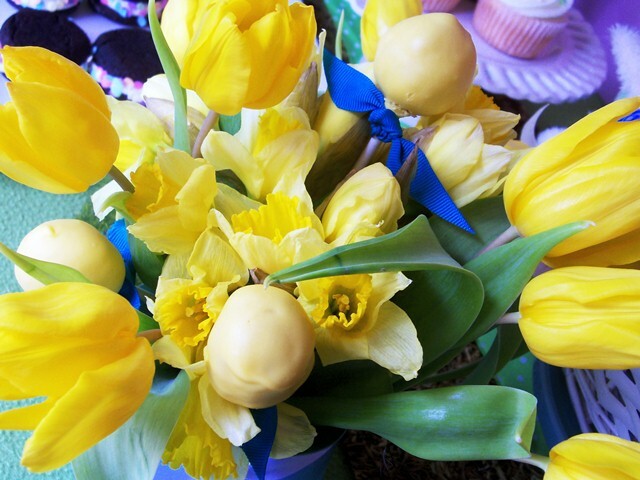 However, creating an affordable sweets table this Easter is super easy to do when you learn the tips and tricks of the pros! Tricked Out Cookies! I like to save money on sweets by purchasing store bought treats like, donuts, snowballs and pre-decorated cookies. I will often embellish some of the treats with sprinkles or frosting. Since making and decorating cupcakes is a part of my business, I like to make my own, but if you aren’t a baker, you do not have to purchase pricey cupcakes from a fancy bakery. You can go to your grocery store and find plain frosted cupcakes and cakes for half the price you’d find at a bakery or cupcake shop. Then, simply add a cute topper for a festive look. Often times, you can find beautifully decorated cookies at your supermarket or local Dollar Store. Simply take these store bought sweets out of their packaging, display them on pretty platters, pair them with one or two fancy desserts like macaroons or petit fours and your own your way to creating a fabulous dessert table. Use What You Have Be sure to use what you have on hand to decorate your table. Place a crisp white or bright colored table cloth onto your table and set up your containers, stands and platters. You can create plate stands by placing a plate on to a small bowl, glass or ramekin for height. Use scrapbook paper or giftwrap to line your plates and platters. 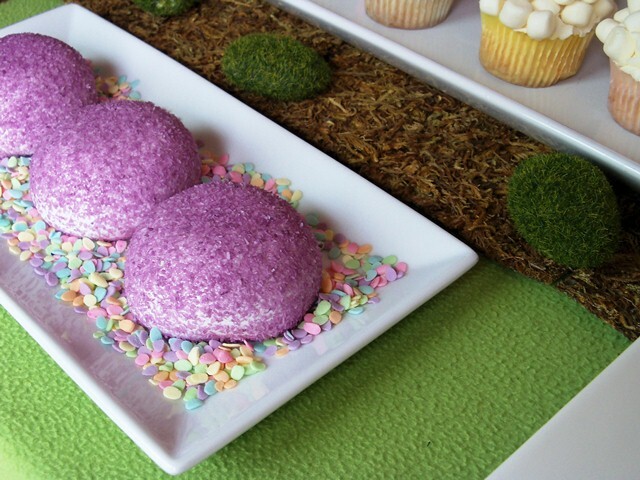 You can also use sprinkles or candy to add color to plain white platters that your sweets will be placed on. Flower vases, cocktail glasses, and mason jars are perfect for displaying colorful candy. If you want to add color behind your table, you can attach a coordinating piece of fabric to a foam board or picture frame along with a cheerful garland for a lovely visual. Add More Flair! Still sticking to using what you have, you can also add visual interest to your display by using decorative items from around your home. Books, hat boxes, stuffed animals, wooden crates and baskets are all items that you can use to add a bit more visual interest to your sweets table. Create Your Own Favor Boxes Always offer your guest a container so they can take extra treats home. 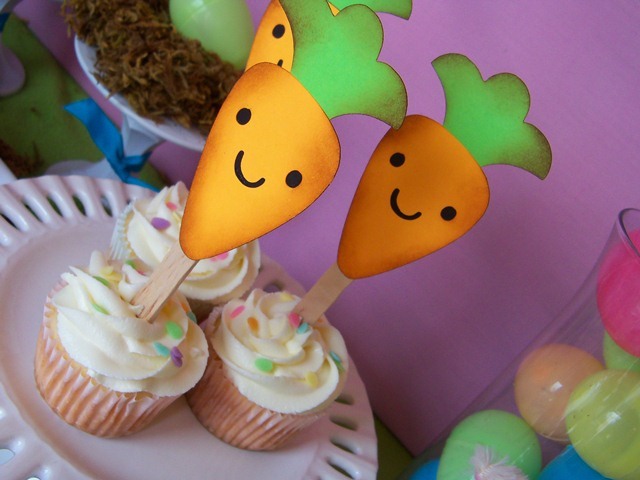 Using orange craft paper, green napkins, clear cellophane bags and ribbon I created cute ‘carrot’ paper cones that guests could fill with candy. I set out a few pre-filled grab and go cones to accommodate guests who may need to leave early. 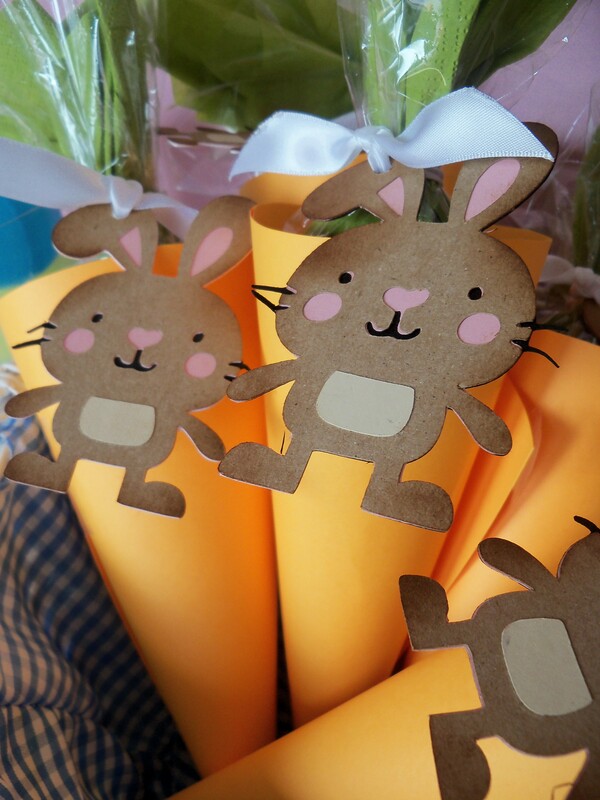 Adding a cute bunny favor tag to the cones really added to the theme of this table. Most people eat between 3-5 small sweets. This number should help you determine how much of each item to have on hand to satisfy your guests’ sweet tooth. A good mix of homemade, store bought and gourmet treats make for a perfect sweets table. Use platters and stands at varying heights to create visual interest. Leave no space unturned! Don’t crowd your table but do try to fill blank spaces on your table with treats or other décor, like a nice floral arrangement or table signs. Shop dollar sections and stores for treats and decor – you will be surprised at what you will find and what you can create for just a few dollars. For more party ideas and inspiration visit Cupcake Wishes & Birthday Dreams and the Cupcake Wishes Store. 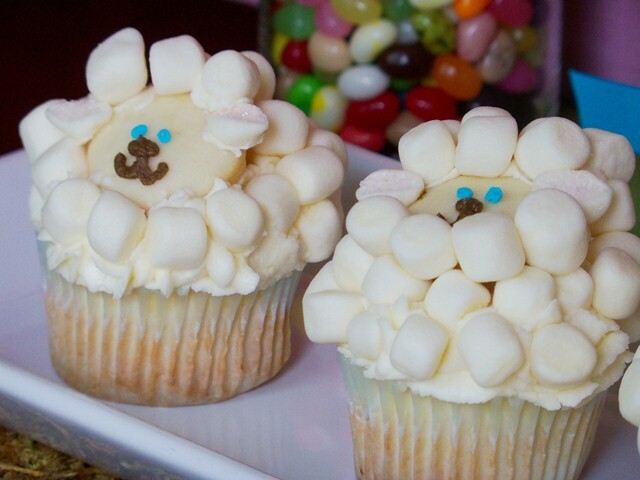 - Want more Easter entertaining ideas? Visit our Events section. 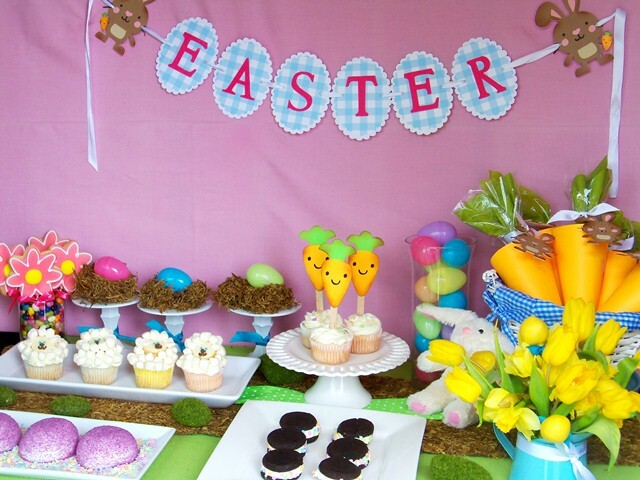 What do you think of this Easter sweets table? Let us know in the comments below.